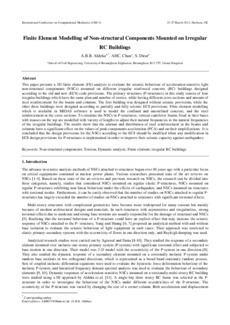 This paper presents a 3D finite element (FE) analysis to evaluate the seismic behaviour of acceleration-sensitive light non-structural components (NSCs) mounted on different irregular reinforced concrete (RC) buildings designed according to the old and new (EC8) code provisions. The primary structures (P-structures) in this study consist of four irregular buildings which have the same plan and number of stories, while having different cross sections and amount of steel reinforcement for the beams and columns. The first building was designed without seismic provisions, while the other three buildings were designed according to partially and fully seismic EC8 provisions. Fibre element modelling which is available in MIDAS software is used to model the confined and unconfined concrete, and the steel reinforcement in the cross sections. To simulate the NSCs in P-structures; vertical cantilever beams fixed at their bases with masses on the top are modelled with variety of lengths to adjust their natural frequencies to the natural frequencies of the irregular buildings. The results show that the amount and distribution of steel reinforcement in the beams and columns have a significant effect on the values of peak components acceleration (PCA) and on their amplifications. It is concluded that the design provisions for the NSCs according to the EC8 should be modified when any modification in EC8 design provisions for P-structures is implemented in order to improve their seismic capacity against earthquakes.